Binz is a beach resort on the eastern coast of Rügen, located on a long beach at the southern end of the Prora bay. The beach is sandy and beautiful, and several km long. Binz was first mentioned in 1318, but only started developing as a beach resort at the end of the 19th century, when swimming in the sea became fashionable. 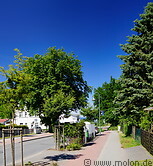 Binz is a picturesque city with many historical villas along the beach built in resort architecture. In the summer Binz is full of tourists.